In the morning I’ve chopped finely (without hearts) 3 cabbages. Each part of the cabbage I’ve placed, layer after layer, in a big plastic bucket, sprinkling each of those with salt and mixing both ingredients with a spoon. 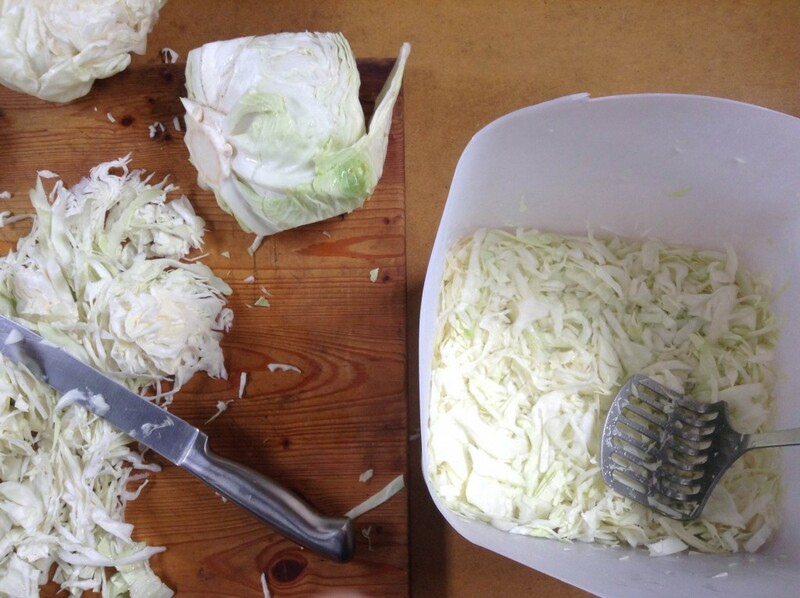 For about 2 kilograms of cabbage I’ve used around 3 tablespoons of salt without additives nor preservatives. Next, with a tool for mashing potatoes (or something similar to it) I was tamping each layer as I would try to squeeze the cabbage as compact as possible. The salt and tamping pulls water out of the cabbage and helps to create the brine in which the cabbage can ferment and sour without rotting. At the end I’ve covered the kraut with a plastic lid fitting almost perfectly to the shape of the bucket and weighted it with a big jar filled with water. It’s to force the water out of the cabbage and keep it submerged under the brine. Especially at the beginning it’s good to press down the weight from time to time to add pressure to the cabbage and help force water out of it so it rises above the cover. I’ve covered such prepared bucket with a cheesecloth to protect it from flies and dust. In the early afternoon together with Maruška we’ve revisited Northern African refugee camp in Ottensheim. This time we were shooting there the material for Dorf Tv. We’ve interviewed Ulrike Böker, the governor of Ottensheim, Dodo working in the camp and couple of other people dwelling there. The variety of refugees is enormous. Their attitude, language, country of origin, background and age can’t be generalised. We’ve met such original characters as the programmer from Iraq using frequently Linux and building his own DIY household robots and TV director from Syria who didn’t manage to get over his profession and started to direct me while operating the camera. We’ve spend there hours drinking tea and smoking shisha, talking about their lives before, during and after travels to Europe. I’ve even tried to find out about some good recipe for fermented food from North Africa but I’ve just gotten a recommendation to ask somebody from Egypt. The program based on the shot footage will be ready on Monday. 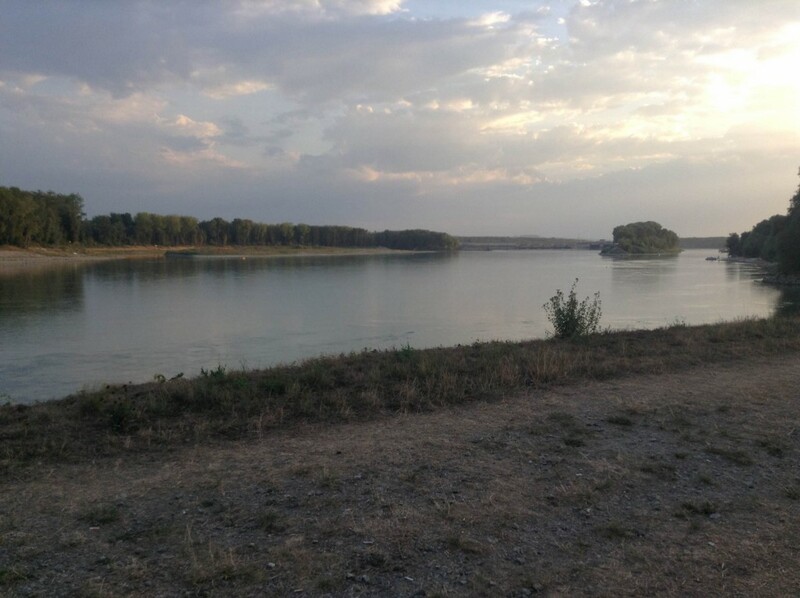 We’ve spend the last hours of this summer eating pizza in Ottensheim watching Danube and approaching rain. The summer seems to be soon over.